Amyotrophic Lateral Sclerosis (ALS) is a degenerative disease of the motor neurons in the brain and spinal cord. It progressively affects all the muscles in the body but there is no known cause and no treatment. Only about 5-10% of cases are inherited while the rest are sporadic. 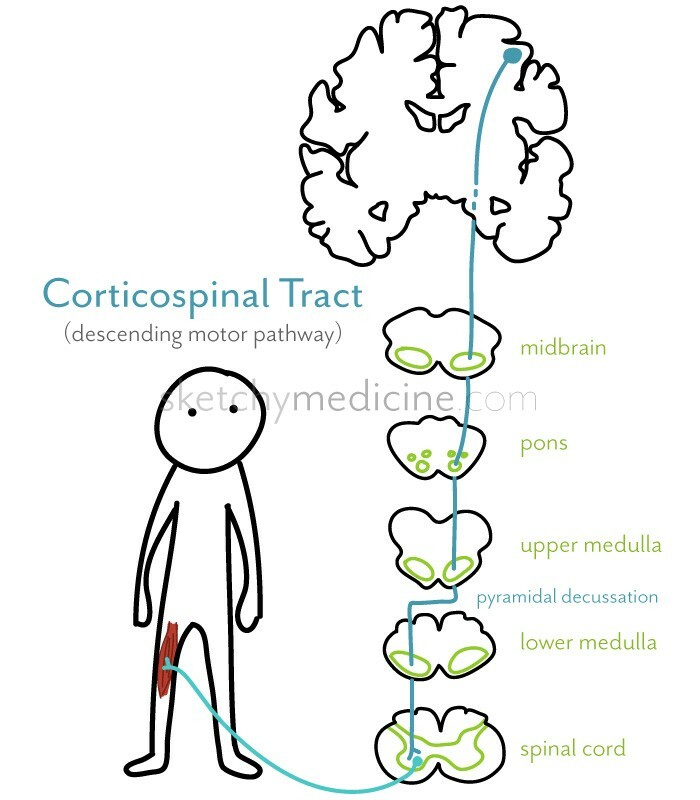 The neurons ALS affects are primarily the upper motor neurons. 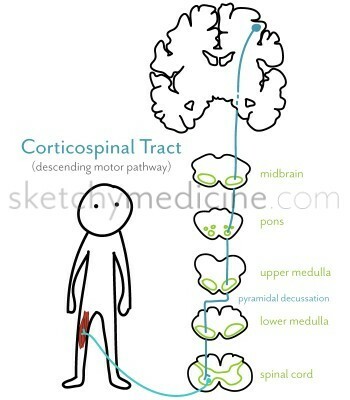 These are the ones that originate in the brain and travel down the spinal cord. These neurons then synapse with the lower motor neurons in the ventral horn, and it is the lower motor neurons that go directly to the muscles. In ALS there are both upper motor neuron and lower motor neuron symptoms. As the neurons die, a constellation of symptoms including numbness, weakness and paralysis emerge. Eventually the paralysis progresses leading to inability to speak, swallow and breath. There is no cure for ALS and treatments only help with the symptoms, they do not slow the progression of the disease. So you may have seen a lot of ice bucket challenges over the last few weeks but please support this cause as it is a horrible disease that up until now had almost no recognition or support. So please donate to The ALS Association (alas.org). And in case you get tired or jaded seeing your social media full of these videos, watch this one of my father doing it. He’s not an emotional guy, but he has lost more than his fair share of friends to this disease. donate to help fund ALS research and support from Ali & Mike on Vimeo. A prolapsed (slipped) disc is when the squishy innards of the disc (nucleus pulposus) bulge out past the stiffer wall of the disc (annulus fibrosis). The problem is that sometimes when this happens, the bulge can impinge the spinal cord or the spinal nerve root. 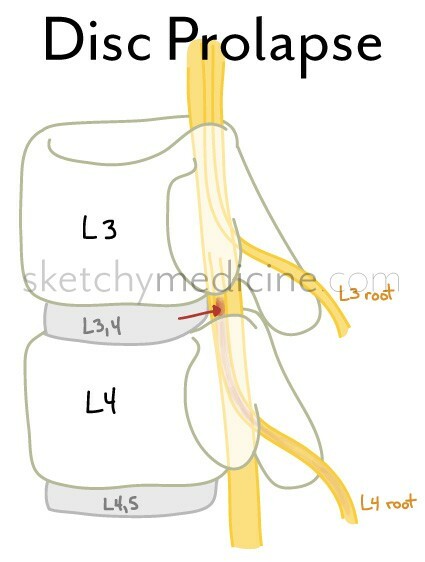 This could result in an anterior cord syndrome (remember this doodle) or it could just knock out the nerve root, resulting in a specific radiculopathy (check out this doodle for where to check for numbness and weakness). 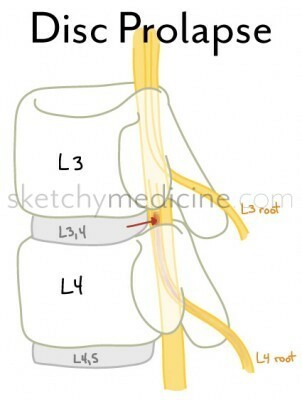 The tricky thing to remember is that though, for example, the L3 root exits at L3, if the L3,4 disc herniates, it doesn’t hit the L3 root but the L4. The disc hits the nerve after it has branched off the spinal cord, but before it has exited the vertebral canal. 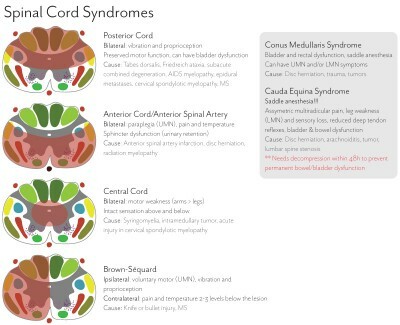 There are 4 main spinal cord syndromes, plus 2 sort-of-spinal-cord syndromes. Some are not common, but a favourite of examiners because they’re just so darn cool in that they really demonstrate where things cross (like in Brown-Sequard syndrome). 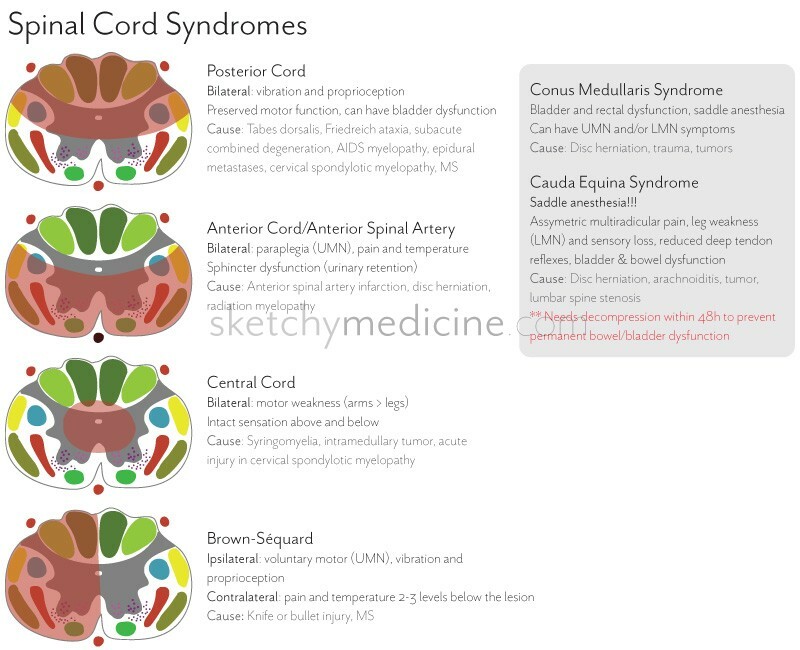 Cauda equina syndrome is also an important one to know because if you see it acutely, the damage can actually be temporary (otherwise the person is stuck with permanent bowel and bladder dysfunction, which is really no fun).